TEOTWAWKI – By Solar Storm? Here’s an interesting story from the LA Times about increased activity on/from the sun and the dangers such things pose to our comfortable life as we currently know and enjoy it. Stated simply – solar storms can disrupt and/or destroy electrical power distribution systems, power lines, transformers, and the devices connected to them. In today’s electricity-dependent world, none of this is good. Much of the planet’s electronic equipment, as well as orbiting satellites, have been built to withstand these periodic geomagnetic storms. But the world is still not prepared for a truly damaging solar storm. There are two key things to appreciate in understanding the vulnerability to LAWKI (Life as we know it). First, solar storms are nothing new. They occur, to greater or lesser extent, all the time. We don’t know enough about the sun to accurately predict its ‘weather’ although we have observed some things over centuries such as the approximately 11 year cycle between periods of lesser activity and periods of greater activity, with the current cycle (the 24th since they started counting and measuring them) expected to peak in May 2013 (assuming the Mayans are wrong and the world doesn’t end in December 2012, of course!). Note also that a period of low activity doesn’t mean no solar storms, and neither does it mean only weak solar storms. It just means fewer solar storms, although there is still the possibility that one of the few that may occur is a really big strong one. If you’d like to know more about this, here’s an interesting page on NASA’s site that discusses the solar cycle and the historical observations to date. In particular, you will find more information about the effects and impact of the huge solar storm in 1859 (mentioned in the LA Times article, but in much less detail). If you don’t bother clicking over to the NASA page, the quick headline is that the 1859 solar storm, if it occurred today, is guesstimated to cause $1 – 2 trillion in damage to our infrastructure and take 4 – 10 years to recover from. This is 10 – 20 times the cost of Hurricane Katrina. Our second point is that our society is becoming increasingly vulnerable to the types of disruptions that a large solar storm would cause. Solar storms, themselves, aren’t getting worse. But the risk they pose to our society is increasing. In 1859, electricity was rare and of little importance. Edison’s electric light bulb wasn’t yet patented (this happened in 1879). Electrical distribution only started in the 1880s. Marconi wasn’t even born until 1874 so there was no radio of any sort. The main disruptions in 1859 were to the telegraph circuits. Today of course, sees electricity inseparable and essential in almost every part of our daily lives. And even when we don’t directly use electricity personally, it has been used somewhere else to produce the goods and services we need and rely upon. We got a taste of what could happen in our modern world when in 1989 a moderate solar storm caused the entire province of Quebec to lose power in 90 seconds, plunging 6 million people into a world without electricity for nine hours. Because this happened at 2.46am local Quebec time (on Monday 13 March) this was at a time of minimal power use, which helped minimize any permanent damage, and also reduced the impact on Quebec’s population, who simply failed to wake up by any electric alarm clocks, and probably most people only experienced a conscious awareness of no power for maybe four hours or so. 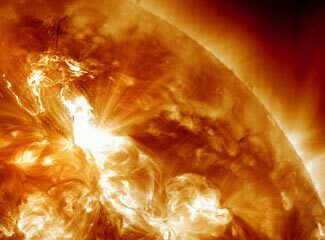 A more powerful solar storm would do more than trip circuit breakers in power stations. It would ‘fry’ transformers (ordering a new transformer typically requires three years or more of lead time until delivery is received, no-one in North America makes power transformers any more),and possibly damage or destroy power lines, and might harm all sorts of devices connected to the mains power. The size of the transient voltages and currents caused by the solar storm could overwhelm the limited capacity of various surge protectors that many devices use as a light layer of protection. The LA Times article says that Britain’s official assumption is that if it were to experience a storm similar to the one that wiped out Quebec’s power grid, then it would expect ‘to lose one or two regions where the power might be out for several months’. If that’s the official stated assumption, the reality could be vastly worse, for Britain, and of course for the US too, if we were to experience a solar storm. But even if Britain were ‘only’ to lose one or two regions, for ‘several’ months (ie probably 3 – 6 months) what would the impacts of that be on the people in those regions? If one of those regions was London, that could mean half the country was without power for six months. You can bet that would be life changing (as in ‘life threatening’)! It is very hard to know exactly what the extent of damage might be. The LA Times plays a bit of a guessing game as to the impacts on our life if there is no electricity, which is a bit like the game of ‘For want of a nail, a kingdom was lost’. For example, no electricity means no power to drive the gas pumps at petrol stations, which means no gas or diesel for trucks or cars, which means no food deliveries, which means – well, most people prefer to pretend not to understand what that means. Remember also that with no gas, you can’t go out into the countryside to the farms to buy food directly – and they have no gas/diesel to run their farm machinery either. And any cool stores for, eg, apples; they’ll have lost their cooling, so all that food would be spoiling too. Never mind food, what about water. No power means no water pumps. Ooops. That means no water coming out of your taps, and with no gas for your car, any water you might get is water you’ll have to walk to find and carry back with you, all by yourself. It also means the sewage systems stop working, too. At least that is probably survivable, albeit unpleasantly so. But with rapidly deteriorating sanitary conditions, expect the spread of disease. Ummmm – did we also mention that without electricity, modern hospitals will completely stop functioning. If you’re in a multi-floor apartment building, no power means no elevators. Again, something you’ll probably survive (unlike no food or water) but it sure is life changing. No power means no light and no heat either – even if you have gas heat in your home, you probably use electricity for the fans that blow the air through the heater and around your house. Alternatively, if it is summer, you’ll have no cooling. No power means your credit cards won’t work, and you won’t be able to get money out of (or into) an ATM either. There goes the banking system. Not to forget, no television, no radio, no phones (neither cell phones nor landlines) and – for some of us, worst of all – no internet. Aaccording to this scholarly article, the possibility of an 1859 type super sun storm occurring in the next ten years are about 12%. That’s a fancy way of saying one chance in eight. Slightly worse odds than Russian roulette with a six chamber revolver. Who do you know who would agree to play a game of Russian roulette once every decade? Probably no-one. However, the same people who are terrified of guns, loaded or empty, pointed at them or safely locked away out of sight, are the same people that sneer at preppers and say there’s no chance of any risk to our modern life and society. Here’s an amazing concept : The chances of a TEOTWAWKI type power disruption from a super solar storm are greater than – for most people – the chances of a house fire. But we all insure our houses, paying maybe $1000 or more a year just in case of a problem. We could all lose our houses and still live. It would be a financial tragedy (assuming we have substantial equity in the house) but our lives would not be risked by the loss of our house. We’d be in a rental apartment within a few days. We’d still have our jobs, our cars, and the rest of our lives. In a week, we’d have bought replacement clothing, and be starting to buy the other essentials in our lives. But the loss of electricity across our entire state or country – that does risk our lives. After a week of no electricity, we’d be worse off, not starting our recovery. After a month, we might be dying of starvation. People spend hundreds, sometimes thousands of dollars each year insuring against a risk that is less likely to occur, and which would have a much less serious impact on their lives if/when it does occur. If it makes sense to spend $1000 a year to insure against the low risk of losing one’s house, how much should one spend a year to insure against the greater risk of a more harmful event – a solar storm destroying our power grid?